This article is about the archaeologist. For other uses, see George Bass (disambiguation). George Fletcher Bass (born December 9, 1932 in Columbia, South Carolina) is recognized as one of the early practitioners of underwater archaeology, along with Peter Throckmorton, Honor Frost, and others. 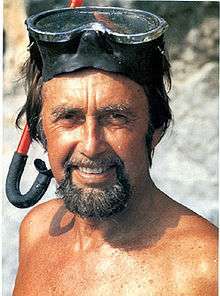 Bass was the director of the first archaeological expedition to entirely excavate an ancient shipwreck: Cape Gelidonya (1960). Since directing his first excavation, he has excavated shipwrecks of the Bronze Age, Classical Age, and the Byzantine. Bass is professor emeritus at Texas A&M University, where he held the George T. and Gladys H. Abell Chair in Nautical Archaeology. He holds an M.A. in Near Eastern Archaeology from The Johns Hopkins University and a Ph.D. in Classical Archaeology from the University of Pennsylvania. In 1973 Bass founded the Institute of Nautical Archaeology (INA). INA has conducted some of the most important excavations of the twentieth century, and its findings throw new light into areas as diverse as the beginning of the free enterprise system, the dating of Homer's Odyssey, chronologies of Egyptian dynasties and Helladic cultures, and the histories of technology, economics, music, art and religion. National Medal of Science (2001). It was presented by President George W. Bush in a White House East Room ceremony on June 12, 2002. Bass was interviewed by Adam Davidson with colleague Fred van Doorninck on This American Life in 2010. ↑ George Fletcher Bass (1967). Cape Gelidonya: a bronze age shipwreck. American Philosophical Society. ↑ Linda Ellis (16 December 2003). Archaeological Method and Theory: An Encyclopedia. Taylor & Francis. pp. 208–. ISBN 978-1-135-58283-8. ↑ "Awards and Prizes". Society for Historical Archaeology. Retrieved September 30, 2016. ↑ "Contents Unknown". This American Life. January 22, 2010. Retrieved January 29, 2014.